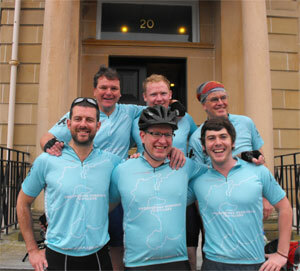 This is the Bruichladdich sales team from Glasgow (with at least one guest rider I think) comprising of Eamonn Jones, David Ferguson, Carl Reavey (back row) and Douglas Taylor, David Keir, Matt Mundell (front row). They left Glasgow on Friday and made their way to Ardrossan for the ferry to Arran. From Brodick they cycled to Lochranza to catch the ferry to Kintyre. Finally over to Kennacraig and the ferry to Islay tonight. The Laddie Cycle Ride is in support of Kidney Research UK in memory of their colleague Craig Matthews, who died recently from kidney failure. The second challenge will kick off on Monday 28/May afternoon, when Allan Campbell, Gavin Campbell and Ally MacNeill will take on the Three Peaks Challenge. The three are raising funds for the Islay and Jura palliative care fund, which is to support patients with a terminal illness on Islay and Jura. You can sponsor them via Paypal, please add your name to your donation. The three have done some training in recent months, including a test climb of Ben Nevis in April. They will try to hit the 24 hour standard, but if there are unforseen problems they've set themselves a target of 30 hours. If you have a Facebook account you can read more on their 3 Peak Challenge Facebook page. All the best to them and a successful challenge!